Lysine-specific histone demethylase 5C (KDM5C) belongs to the jumonji family of demethylases and is specific for the di- and tri-demethylation of lysine 4 residues on histone 3 (H3K4 me2/3). KDM5C is expressed in the brain and skeletal muscles of humans and is associated with various biologically significant processes. KDM5C is known to be associated with X-linked mental retardation and is also involved in the development of cancer. However, the developmental significance of KDM5C has not been explored yet. In the present study, we investigated the physiological roles of KDM5C during Xenopus laevis embryonic development. Loss-of-function analysis using kdm5c antisense morpholino oligonucleotides indicated that kdm5c knockdown led to small-sized heads, reduced cartilage size, and malformed eyes (i.e., small-sized and deformed eyes). Molecular analyses of KDM5C functional roles using whole-mount in situ hybridization, β-galactosidase staining, and reverse transcription-polymerase chain reaction revealed that loss of kdm5c resulted in reduced expression levels of neural crest specifiers and genes involved in eye development. Furthermore, transcriptome analysis indicated the significance of KDM5C in morphogenesis and organogenesis. Our findings indicated that KDM5C is associated with embryonic development and provided additional information regarding the complex and dynamic gene network that regulates neural crest formation and eye development. This study emphasizes the functional significance of KDM5C in Xenopus embryogenesis; however, further analysis is needed to explore the interactions of KDM5C with specific developmental genes. Embryonic organ development is a highly organized and complex process involving the temporal and spatial expression of genes that control differentiation, maturation, and survival of organs . Additionally, this process involves the formation and migration of cells that are destined to differentiate into specific structures essential for proper development of the organism, such as the neural crest . The neural crest is comprised of stem-like cells that are predestined to migrate extensively and differentiate into specialized cell types during vertebrate embryogenesis . Induction of neural crest cells begins at the gastrula stage of development. Neural crest progenitors are initially identified at the edge of the neural plate, forming a bridge between the neural and non-neural portion of the ectoderm, and require tissue interactions between the neural plate and ectoderm . Before undergoing migration, neural crest cells are localized to the dorsal part of the neural tube . Neural crest cells later migrate throughout the body and give rise to various types of cells, such as melanocytes, craniofacial cartilage and bone, smooth muscles, and peripheral nervous cells . Formation and migration of neural crest cells and development of different organs during vertebrate embryogenesis require regulated gene expression [7, 8], which is affected by the epigenome . Epigenetic modifications, such as methylation, phosphorylation, and ubiquitination, play significant roles in regulating gene expression and interaction to fulfill specific functions ; for example, histone lysine methylation leads to the activation or suppression of certain genes . The methylation status of histones is regulated by several types of methyltransferases (KMTs) and demethylases (DMTs) ; thus far, two groups of histone demethylases implicated in diverse biological functions have been discovered [13, 14]. Lysine-specific histone demethylase 5C (KDM5C; also known as JARID1C and SMCX) catalyzes the demethylation of lysine 4 on histone 3 (H3K4me3/me2). Since H3K4me3 and H3K4me2 are associated with actively transcribed genes, demethylation of H3K4 by KDM5C causes transcriptional repression [15, 16]. In mammalian cells, KDM5C belongs to a protein subfamily consisting of four members, namely KDM5A/retinoblastoma binding protein 2 (RBP2)/JARID1A, KDM5B/PLU-1/JARID1B, KDM5C/SMCX/JARID1C, and KDM5D/SMCY/JARID1D . KDM5C contains the catalytic jumonji C (JmjC) and jumonji N (JmjN) domains, which are involved in the maintenance of JmjC domain structural integrity and possess an ARID/BRIGHT DNA binding domain , a single C5HC2 zinc finger domain located at the C-terminal of the JmjC domain, and two plant homeodomains (PHD) that bind to the methyl lysine residue . The kdm5c gene, which is located on the X chromosome, has recently been identified as the gene responsible for X-linked mental retardation (XLMR) . XLMR is a heterogeneous disease that is affected by genetic, environmental, and stochastic factors . Notably, kdm5c mutations found in XLMR diminish the ability of KDM5C to demethylate H3K4, indicating that the demethylation activity of KDM5C is critical for brain development [21–23]. KDM5C is highly expressed in the brain and skeletal muscle tissue in humans , and human KDM5C is involved in the inhibition of specific neuronal genes. In the mouse brain, kdm5c is widely expressed in regions related to cognitive and emotional behaviors, including the prefrontal cortex, hippocampus, and amygdala . kdm5c-knockout mice exhibit abnormal social behavior including aggression as well as impaired learning and memory [20, 24]. In addition, KDM5C escapes X-inactivation in both mice and humans . In zebrafish, knockdown of the kdm5c homologue induces brain-patterning defects and neuronal cell death, while small interfering RNA (siRNA)-mediated knockdown of kdm5c in primary rat granule neurons damaged dendritic morphogenesis . Furthermore, KDM5C has been implicated in renal cancer . In the current study, we investigated the functional significance of KDM5C during Xenopus embryogenesis, where the spatiotemporal expression of kdm5c indicated that it is a maternal gene. 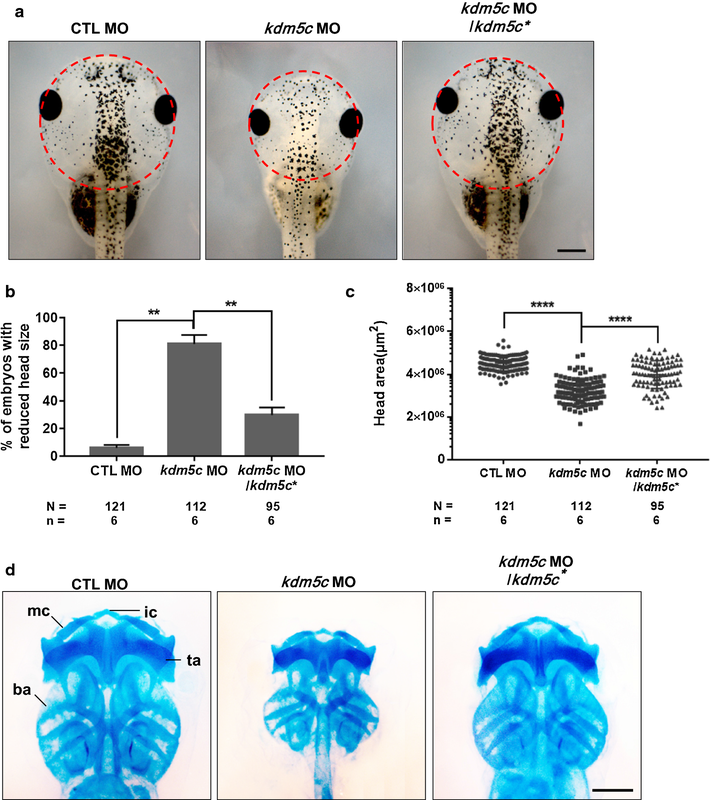 Loss-of-function studies using kdm5c morpholino oligonucleotides (MO) demonstrated the significance of this demethylase in neural crest migration and eye development. Whole-mount in situ hybridization (WISH) and reverse transcription-polymerase chain reaction (RT-PCR) analyses indicated that kdm5c knockdown led to inhibition of neural crest migration and defects in eye development. Furthermore, transcriptome analysis of kdm5c MO-injected embryos showed that KDM5C is critical for morphogenesis of anatomical structures and organogenesis during Xenopus embryonic development. Collectively, we concluded that KDM5C plays significant roles in neural crest migration and eye formation during vertebrate development. To investigate the specific roles of KDM5C during embryogenesis, we first analyzed its gene expression pattern in Xenopus. For this purpose, we conducted RT-PCR and WISH analyses. RT-PCR revealed that kdm5c is a maternal gene, as it was found expressed throughout embryonic development from the single-cell stage to the tadpole stage (Fig. 1a). The temporal expression pattern of kdm5c indicated that this gene possesses essential functions during Xenopus development. WISH analysis was performed to determine the spatial expression patterns of kdm5c during Xenopus embryonic development at different developmental stages (st. 6, 9, 13, 16, 22, 32, and 36; Fig. 1b–k′). The expression pattern of kdm5c indicated that this gene is expressed in the animal hemisphere of developing embryos at developmental stage 6 (Fig. 1b). Additionally, kdm5c expression was observed in late blastula-stage embryos showing enhanced expression in the animal pole (st. 9; Fig. 1c). Tissue-specific expression of kdm5c was observed during the neurula stage of embryonic development and was found expressed in the early eye field region at stage 13 (Fig. 1d). We also observed kdm5c expression in the anterior neural tissues of neurula stage embryos (st. 16; Fig. 1e) with dorsal expression in the neural plate border region (Fig. 1e′). Vibratome section analysis confirmed kdm5c expression in neural plate and neural plate border regions (Fig. 1f). We also examined the expression patterns of kdm5c during early and late tailbud stages by focusing on the lateral views of developing embryos and by transverse sectioning these embryos for detailed analysis (st. 22, 32, and 36). Our data demonstrated kdm5c expression in the branchial arches and eyes of early tailbud stage (Fig. 1g) as well as in the whole brain of late tailbud stage Xenopus embryos (Fig. 1h, h′). Although kdm5c expression was observed in the whole brain, elevated expression levels of kdm5c were detected in the forebrain and hindbrain regions of developing embryos (Fig. 1h′) as well as in the midbrain regions as revealed by transverse embryo sections (Fig. 1i, k). In addition to the whole brain, enhanced kdm5c expression was also observed in the retina and lens of Xenopus embryos (Fig. 1h′, j′). A detailed view of the embryos through vibratome transverse sections indicated that kdm5c is predominantly expressed in the lens and retina (Fig. 1i, k); furthermore, kdm5c was found strongly expressed in the ganglion cell layer of the eye (Fig. 1k′). Based on these findings, it is evident that KDM5C is significant during embryogenesis. To gain insights into the physiological functions of KDM5C during Xenopus embryogenesis, we conducted knockdown studies using kdm5c MOs by microinjecting kdm5c MO (48 ng) into one-cell stage embryos. To investigate the specificity of kdm5c MOs in the knockdown of kdm5c, analyzing endogenous KDM5C levels by using anti-KDM5C antibodies is the most suitable; however, due to the lack in availability of anti-KDM5C antibodies for Xenopus, we synthesized kdm5c mutant RNA using wobble base pairing (kdm5c**) and carried out western blot analysis of control embryos, embryos injected with MO-bound kdm5c mRNA, kdm5c*, and kdm5c* together with the MO. Our results revealed that kdm5c translation was blocked in MO-bound kdm5c mRNA (Additional file 1: Fig. S1). Moreover, KDM5C protein expression of embryos injected with mutated kdm5c or coinjected with mutated kdm5c and MO verified the specificity of the kdm5c MO (Additional file 1: Fig. S1). Microinjection of kdm5c MO resulted in phenotypic abnormalities, such as small-sized heads and reduced cartilage size (Fig. 2a–d). Compared with control embryos, over 80% of kdm5c MO-injected embryos exhibited smaller-sized heads (Fig. 2b). Moreover, we investigated head size by measuring the head area of kdm5c morphants relative to the head area of control MO-injected embryos and observed significantly smaller head areas of approximately 70% upon kdm5c depletion (Fig. 2c). To further investigate these cartilage defects, we carried out alcian blue staining of kdm5c MO-injected embryos (st. 46). The results indicated that kdm5c morphants exhibited a marked reduction in cartilage size compared with that of control MO-injected embryos, whereas cartilage structure was not affected (Fig. 2d). To rule out the unspecific side effects of MOs using kdm5c RNA, we carried out rescue experiments by microinjecting Xenopus embryos with kdm5c mutant RNA along with kdm5c MO. Injection of mutant kdm5c* RNA (1.6 ng) rescued all phenotypic malformations induced by the kdm5c MO (Fig. 2a–d); embryos injected with mutant kdm5c* recovered approximately 88% of head area reduction (Fig. 2c). Taken together, these findings indicate that KDM5C is specifically involved in head and cartilage development during embryogenesis. Cell number plays a significant role in determining organ as well as whole organism size. To maintain constant size, cell number is tightly controlled by different mechanisms including apoptosis and cell proliferation, which are indispensable for regulating cell number and consequently organ size . To elucidate whether the reduced head and cartilage sizes induced by kdm5c knockdown were due to perturbation of apoptosis and cell proliferation, we coinjected kdm5c MO and β-galactosidase mRNA unilaterally into one blastomere of two-cell stage embryos and performed terminal deoxynucleotidyl transferase-mediated dUTP nick end labeling (TUNEL) and pH3 (phospho-histone H3) staining at stage 32 (Fig. 3). The uninjected side of the embryos served as an internal control, while β-galactosidase mRNA was used as a lineage tracer. TUNEL staining revealed a significant increase in TUNEL-positive cells after kdm5c depletion in the kdm5c MO-injected side compared with the uninjected side of the embryos (Fig. 3a, b), indicating involvement of KDM5C in apoptosis regulation. Moreover, pH3 staining indicated significant reduction in cell proliferation in the kdm5c MO-injected side of the embryos compared with that of the uninjected side (Fig. 3c, d). Therefore, the mechanism underlying reduced head and cartilage sizes may be the result of a significant increase in apoptosis and marked decrease in cell proliferation due to kdm5c depletion. Neural crest development is regulated by the dynamic expression of a number of genes, including sox3 , pax3 , twist , slug , and members of the soxE family, i.e., sox8, sox9, and sox10 . To evaluate the functions of kdm5c in neural crest development, we performed a loss-of-function analysis using the kdm5c MO and examined its effects on expression of neural crest specifiers. Embryos at the two-cell stage were unilaterally coinjected with kdm5c MO and β-galactosidase mRNA into one blastomere of two-cell stage embryos, after which WISH was performed using these neural crest specifiers. Our results showed sox3 and pax3 expressions in the expanded neural plate regions of the kdm5c MO-injected side of embryos (Fig. 4a, b), while RT-PCR analysis indicated similar expression levels of sox3 and pax3 between control and kdm5c MO-injected embryos (Fig. 4c). In contrast to sox3 and pax3, downregulated expression was observed for twist, slug, sox8, and sox10 in the kdm5c MO-injected side; however, sox9 expression remained unaffected (Fig. 5a, b). sox8, sox9, and sox10 belong to the SoxE protein family and play a significant role along with other neural crest specifiers (i.e., twist and snail). sox9 is expressed in cranial and cardiac neural crest cells and precedes the expression of sox8 and sox10 . Thus, we speculated that the unaffected expression levels of sox9 in the kdm5c MO-injected side are why the cranial cartilage did not exhibit deformations, only a reduction in size (Figs. 2d, 5a, b). To further clarify the expression of these neural crest-specific genes, RT-PCR analysis indicated that expression levels of twist, slug, sox8, and sox10 were considerably reduced, while sox9 remained unaltered in kdm5c MO-injected embryos compared with control MO (Fig. 5c). We further examined the twist expression pattern during the late tailbud stage (st. 32) to analyze the effect of kdm5c knockdown on neural crest migration. Perturbed twist expression was observed during later stages of embryonic development after kdm5c knockdown, indicating abnormal migration of neural crest cells (Fig. 5d, e). Moreover, the abnormal expression patterns of neural crest specifiers were significantly rescued by injecting kdm5c mutant RNA, ruling out any unspecific side effects of the kdm5c MOs (Figs. 4a–c, 5a–e). 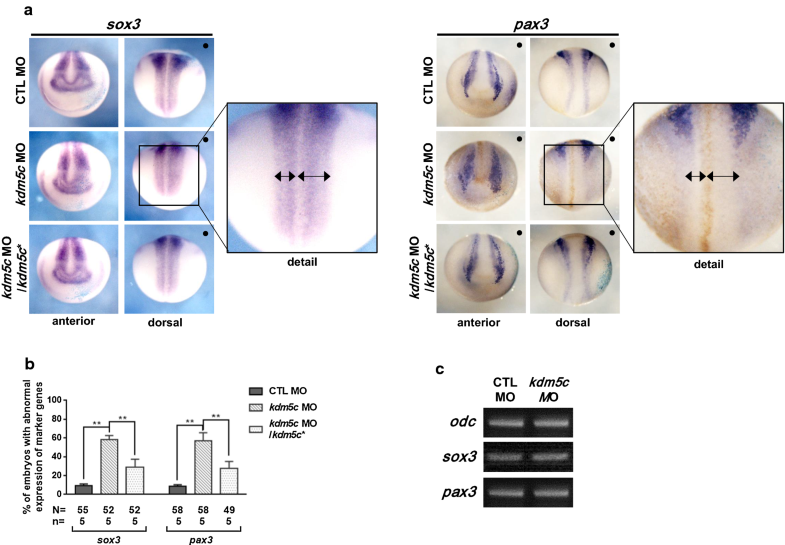 Altogether, these results indicate that KDM5C is required for the expression of neural crest specifiers; thus, perturbation of kdm5c expression altered expression patterns and influenced neural crest migration. As our spatial expression analysis of kdm5c in Xenopus embryos indicated enriched expression of kdm5c in the eye regions (Fig. 1g–k′) and on the basis of the well-established Xenopus fate maps, we sought to investigate the involvement of kdm5c in eye development during Xenopus embryogenesis. Thus, we conducted unilateral microinjection of kdm5c into eight-cell stage Xenopus embryos and found that kdm5c morphants exhibited significantly smaller and deformed eyes, i.e., coloboma/optic fissures, compared with that of control embryos (Fig. 6a, d). Statistical analysis revealed that compared with control embryos, more than 80% of kdm5c MO-injected embryos exhibited eye defects (Fig. 6b) and among the kdm5c morphants, approximately 20% exhibited small-sized eyes and 60% possessed deformed eyes (Fig. 6c). Additionally, histological analysis of the eye structure through vibratome sections indicated that kdm5c morphants exhibited abnormal retinal pigment epithelium (Fig. 6a). For validating the specificity of kdm5c MO-induced eye defects, we performed rescue experiments that confirmed the eye malformations observed in kdm5c morphants were specifically caused by a depletion of kdm5c and not through unspecific side effects of kdm5c MOs (Fig. 6a–c). In short, our results implicate kdm5c in eye development during Xenopus embryogenesis. Loss of kdm5c induced phenotypic eye defects of coloboma/optic fissures in the morphant embryos (Fig. 6a–d), which may have resulted from non-closure of the choroid fissure, leading to coloboma. Dorsoventral (DV) patterning of the retina is important for the choroid fissure, and impairment of DV patterning can result in colobomas. Retina DV patterning is controlled by asymmetric expression of transcription factors, such as vax1 (optical stalk-specific), vax2 (optical stalk and ventral retina-specific), pax6 (ventral and dorsal retina-specific), and tbx5 (dorsal retina-specific), that regionalize optic vesicle into three compartments, i.e., optic stalk, dorsal retina, and ventral retina . Thus, we examined the effects of kdm5c knockdown on DV patterning by analyzing the expression of DV-patterning markers (vax1, vax2, pax6, and tbx5) through WISH. We found that depletion of kdm5c significantly downregulated vax1, vax2, pax6 expressions, while tbx5 expression was slightly reduced (Fig. 6e); thus, the reduced expression of DV-patterning markers may be responsible for the colobomas observed in kdm5c morphants. In addition to colobomas, vibratome sections of kdm5c morphants indicated retinal lamination defects (Fig. 6a). Therefore, we performed WISH with the well-known eye-specific markers arr3 (photoreceptor cell-specific), prox1 (horizontal cell-specific), vsx1 (bipolar cell-specific), and pax6 (ganglion and amacrine cell-specific) to further analyze kdm5c morphant eyes (st. 40). We obtained both mild and severe phenotypes through WISH analysis as well as severe disorganization of retinal cell layers (Fig. 6f). Overall, our findings indicate that kdm5c knockdown induced severe eye defects, including colobomas and perturbed retinal lamination. We further investigated the roles of KDM5C at the molecular level during eye development by coinjecting kdm5c MO and β-galactosidase mRNA unilaterally into one dorsal blastomere of eight-cell stage embryos. WISH analysis of these kdm5c MO/β-galactosidase mRNA-coinjected embryos was performed to evaluate the effect of kdm5c knockdown on eye field induction and differentiation by examining the expression patterns of otx2 , rax , and pax6  at stage 16 of embryogenesis. Compared with control, otx2, rax, and pax6 expressions were downregulated in the kdm5c MO-injected side of the embryos (Fig. 7a, b). Furthermore, we examined the effect of kdm5c knockdown on eye differentiation at stage 32 (Fig. 7c, d) and found that all tested eye-specific markers exhibited reduced expression levels in the kdm5c MO-injected side, whereas normal expression was observed on the uninjected side of the embryos. WISH analysis with cryba1 specific for the vertebrate eye lens  was also conducted at stage 32; however, kdm5c knockdown did not affect lens development during Xenopus embryogenesis (Fig. 7e, f). RT-PCR analysis further confirmed that the presence of KDM5C is significant during eye field induction and differentiation but is not required during eye lens development (Fig. 7g). Moreover, rescue experiments effectively recovered the reduced expression levels of eye-specific markers induced by kdm5c knockdown (Fig. 7a–f), verifying the specificity of KDM5C in eye development during Xenopus embryogenesis. Altogether, our results demonstrate that KDM5C plays an important role during eye field induction and differentiation and that loss of kdm5c results in anomalies of retina formation during Xenopus embryogenesis. To pinpoint target genes specifically affected by kdm5c knockdown, we performed a transcriptome analysis of kdm5c morphants. Total RNA of kdm5c morphants was extracted and processed for transcriptome and RNA sequence analysis. RNA sequence analysis identified important gene groups (Additional file 2: Fig. S2); genes were classified into 19 groups using PANTHER gene ontology; and a bar chart was plotted based on the downregulated expression of these gene groups in the kdm5c morphants (Additional file 2: Fig. S2). These analyses indicated that kdm5c plays significant roles in morphogenesis. To validate RNA sequence analysis, genes with high fold-change values were selected and RT-PCR was performed to analyze the expression of these genes in kdm5c morphants. 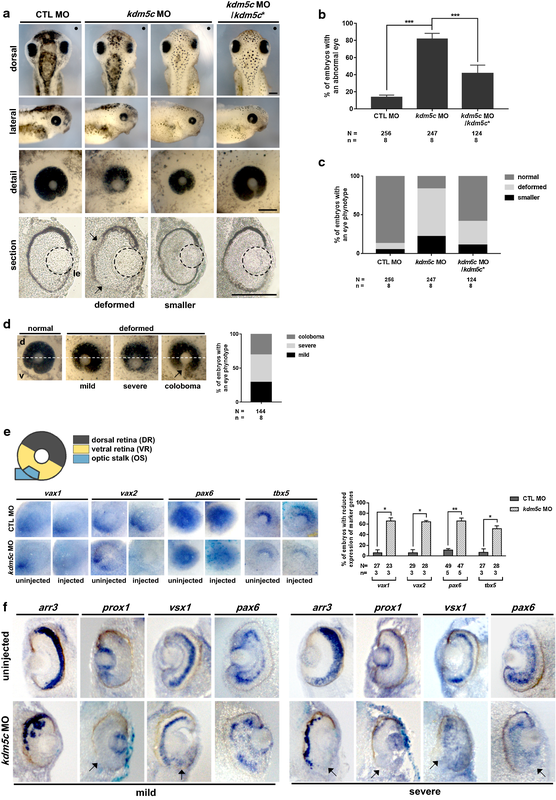 epha4, epha2, efnb2, sox8, sox10, aldh1a2, and wnt8a are all genes involved in the regulation of eye and neural crest development during embryogenesis [39–43]. We found that epha4, epha2, efnb2, sox8, sox10, aldh1a2, and wnt8a were downregulated among several other genes (Fig. 8). RT-PCR showed reduced gene expression of sox8, sox10, and wnt8a, confirming that kdm5c is essential for the regulation of neural crest development (Figs. 5c, 8). Moreover, the downregulated expression patterns of epha4, epha2, efnb2, and aldh1a2 validated the involvement of KDM5C in eye development during embryogenesis (Fig. 8). Overall, our results demonstrate that KDM5C is critical for morphogenesis and specifically influences neural crest development and eye formation during embryonic development. Members of the jumonji family of histone demethylases have emerged as significant regulators of epigenetic events [16, 44] and have been implicated in diverse biological processes ranging from developmental events to the pathogenesis of several diseases . KDM5C catalyzes the di- and tri-demethylation of H3K4 and is associated with transcriptional repression . This demethylase is strongly expressed in human brain and skeletal muscle tissues and is associated with memory defects and aggressive tendencies in kdm5c-knockout mice . KDM5C has also been implicated in XLMR as kdm5c mutations are typically observed in XLMR patients [20, 21]. Moreover, KDM5C has been studied with regard to its significance in X-inactivation and has been associated with certain types of cancer [22, 23]. However, KDM5C has not been investigated for its roles during embryonic development. In the current study, we sought to explore the physiological significance of KDM5C during Xenopus embryogenesis. Xenopus is an excellent animal model for the study of gene function as genetic overexpression or knockdown can be induced by RNA or DNA microinjection into fertilized eggs; consequently, gene expression can be observed throughout different stages of embryonic development . The spatiotemporal expression pattern of kdm5c demonstrated that it is a maternal gene (Fig. 1a) and is specifically expressed in the branchial arches as well as the prospective eye field and brain of developing embryos (Fig. 1b–k′). The functional significance of kdm5c was evaluated by microinjecting kdm5c MOs into one-cell stage embryos. Loss-of-function analysis revealed that kdm5c is essential for proper embryonic development and that loss of kdm5c induced phenotypic malformations—reduced head size, smaller cartilage, and defective eyes—in the morphant embryos (Figs. 2, 6). The reduction in cartilage and head size was supported by increased apoptosis and decreased cell proliferation in kdm5c morphant embryos (Fig. 3). These findings led us to hypothesize that KDM5C plays critical roles in embryonic morphogenesis and organ development. Our observed phenotypes of reduced head and cartilage size are in agreement with the finding that kdm5c mutations lead to XLMR in humans, who also exhibit microcephaly . It would thus be interesting to further examine whether exogenous kdm5c can rescue microcephaly in affected humans. Neural crest cells are multipotent cells that can differentiate into several cell types, such as melanocytes, skeletal muscle, craniofacial cartilage, and bone [47, 48]. Neural crest morphogenesis has three distinct phases and is associated with the differentiation ability of neural crest cells . Transcription factor genes including sox3 , pax3 , sox8 , sox9, sox10 , twist [31, 51], and slug  are involved in the migration and differentiation of the neural crest. kdm5c knockdown led to reduced head and cartilage sizes; thus, investigating these malformations on a molecular level revealed that KDM5C is involved in the migration and differentiation of neural crest cells by altering expression of neural crest specifiers (Figs. 4, 5). The process of organogenesis is controlled by several distinct epigenetic events . Our knockdown experiments showed that loss of kdm5c induced eye defects such as coloboma and disturbed retinal lamination in the developing embryos. Coloboma formation in kdm5c morphants may be the result of perturbed expression of DV-patterning markers (Fig. 6e) and aldh1a2 (retinoid metabolism-specific; Fig. 8). Retinoic acid plays a significant role in eye development through retinoic acid receptor (RAR) signaling that are involved in regulation of choroid fissure closure . 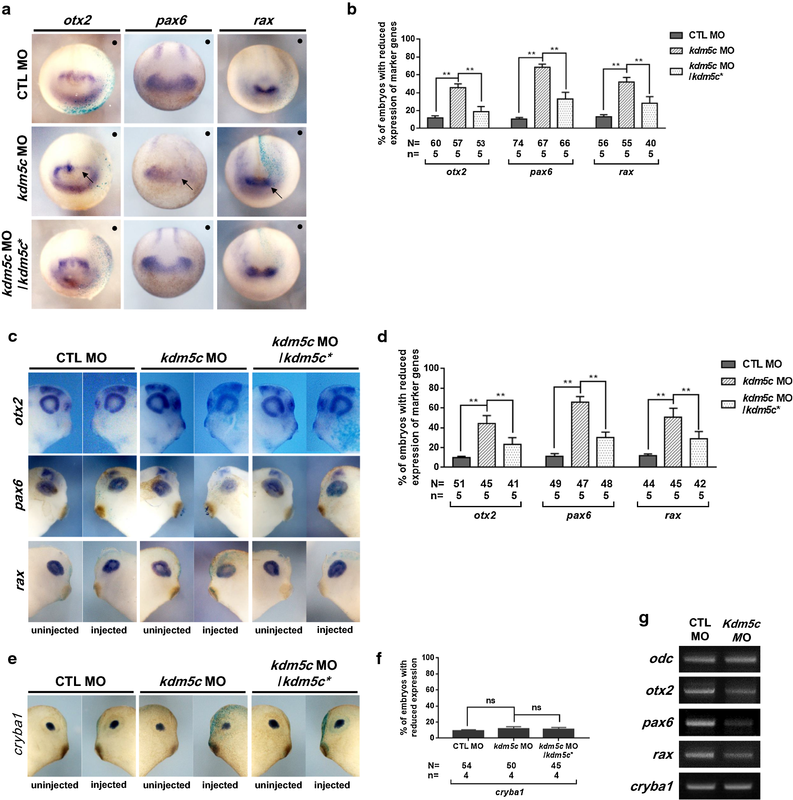 aldh1a2 is involved in the regulation of RAR signaling [52, 53], and thus, its downregulated expression may be the underlying cause of coloboma in kdm5c morphants. WISH analysis using retinal cell-specific markers revealed that kdm5c knockdown affected the ganglion cell layer and resulted in malformed retinas. Although the eyes were in the proper position, the retinas of injected embryos were extensively malformed (Fig. 6a, d). Altogether, detailed analysis of eye defects in kdm5c MO-injected embryos (Fig. 6) indicated the importance of KDM5C in eye development during Xenopus embryogenesis. To investigate the involvement of KDM5C in early eye field induction and differentiation, we analyzed marker gene expression during early (st. 16) and late (st. 32) stages of embryonic development. We found that otx2, rax, and pax6 were strongly inhibited upon kdm5c knockdown (Fig. 7a–d). This is consistent with previous observations that perturbation in expression patterns of any of these genes is associated with eye defects [54–56]. Interestingly, these genes are associated with eye abnormalities in humans, which includes small eyes and colobomas [35, 37]. Therefore, it will be interesting to uncover whether KDM5C is involved in human ocular defects. Morphogenesis is a critical biological process regulated by a set of genes that sequentially turn the developmental process on or off in a precise spatiotemporal pattern . The expression of these regulatory genes is in turn controlled by several upstream factors. RNA sequence analysis of kdm5c MO-injected embryos demonstrated the significance of KDM5C in organogenesis and morphogenesis of anatomical structures (Additional file 2: Fig. S2). RT-PCR data further confirmed the downregulated expression patterns of epha4, epha2, efnb2, and aldh1a2, which are all genes associated with eye development, as well as reduced gene expression of sox8, sox10, and wnt8a which are involved in neural crest migration (Fig. 8). 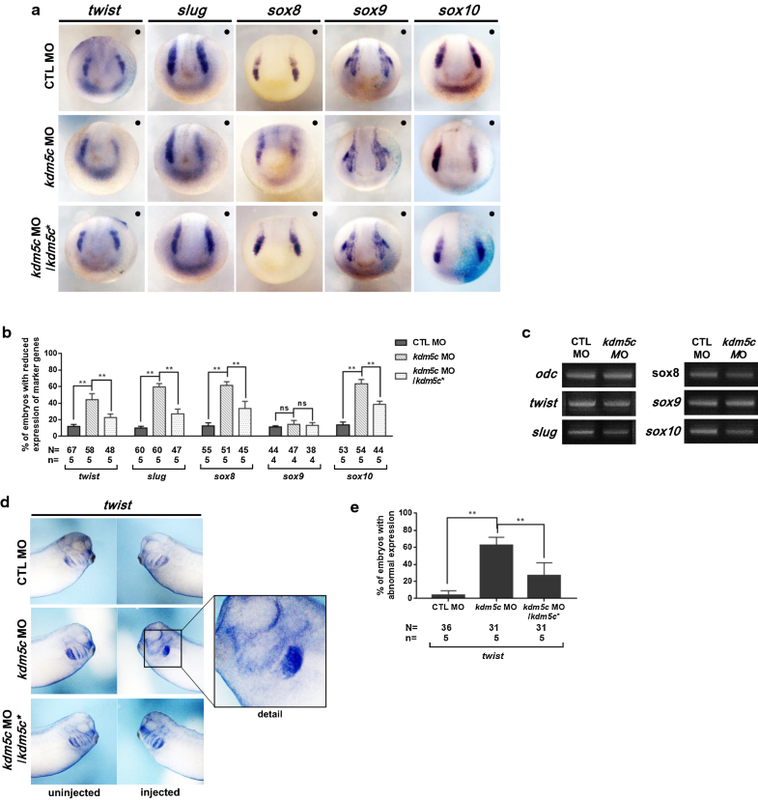 Previous studies have shown that epha4 and its interacting partner sipa1l3 are significant during eye development and that their depletion led to an increase in the Wnt/β-catenin target axin2 . As kdm5c depletion is associated with downregulation of epha4 and wnt8a (Fig. 8), it is possible that KDM5C is also involved in Wnt signaling. Therefore, further elucidation of Wnt signaling regulation by KDM5C is warranted. The association of KDM5C with neural crest specifiers and key genes involved in eye development provides additional information regarding the complex and dynamic genetic networks that regulate neural crest and eye development. Furthermore, our findings highlight the significance of epigenetic regulators in controlling the spatiotemporal expression of genes during embryonic development. Our observations also raise the possibility that this repressive histone marker may contribute to developmental disorders owing to its critical role in regulating methylation patterns of key developmental genes. cDNA was synthesized from total RNA of tailbud stage embryos. Based on the kdm5c sequences in NCBI and Xenbase, primers were designed for cloning kdm5c. Flag-tagged kdm5c mRNA was generated by PCR and a plasmid was constructed using the pCS107 vector, which included restriction sites for ClaI and XhoI. This study was performed in strict accordance with the guidelines of the Animal Care and Use Committee and in agreement with international laws and policies (National Institutes of Health Guide for the Care and Use of Laboratory Animals, Publication No. 85-23, 1985). The Institutional Review Board of the Ulsan National Institute of Science and Technology approved the experimental use of amphibians (Approval No. UNISTACUC-16-14). All members of our laboratory attended educational and training courses on the proper care and use of experimental animals. Adult Xenopus obtained from the Korean Xenopus Resource Center for Research were housed at 18 °C under 12-h light/12-h dark conditions in containers recommended by the Institutional Review Board of the Ulsan National Institute of Science and Technology. Ovulation was induced in Xenopus females by injecting 1000 IU of human chorionic gonadotropin into the dorsal lymph sac in the evening before the experiment. The next day, eggs were collected in 60-mm petri dishes containing 1X MBS (88 mM NaCl, 5 mM HEPES, 2.5 mM NaHCO3, 1 mM KCl, 1 mM MgSO4, and 0.7 mM CaCl2, pH 7.8) by squeezing Xenopus females. After several washes with 0.1X MBS, eggs were fertilized using a sperm suspension solution derived from the isolated testes of sacrificed male frogs. After successful fertilization, the jelly coat was removed by swirling the embryos in 2% l-cysteine solution, and then, the embryos were washed five times with 0.5X MBS. Unfertilized eggs and dead embryos were removed, and then, healthy embryos were transferred into 0.5X MBS containing 2% Ficoll® 400 (GE Healthcare, Little Chalfont, UK) at 15–18 °C. For microinjection, capped mRNAs were synthesized using the SP6 mMessage mMachine® kit (Ambion, Austin, TX). pCS107/kdm5c-Flag constructs were linearized with ApaI. The kdm5c MO consisted of 25 nucleotides and was designed as follows: 5′-ATGTTGAACATGGAGACTGAAGACT-3′ (Gene Tools, Philomath, OR). mRNA or kdm5c MO were coinjected into one cell stage embryos while for WISH analysis mRNA or kdm5c MO were unilaterally injected into two-cell and eight-cell stage embryos. Embryos were incubated at 23 °C until the required stages of embryogenesis stages. Protein lysates were prepared by homogenizing embryos in lysis buffer (137 mM NaCl, 20 mM Tris–HCl pH 8.0, 1% Nonidet-P40, and 10% glycerol) supplemented with 1 mM phenylmethylsulfonyl fluoride, 5 mM sodium orthovanadate, and 1X protease inhibitor mixture. Embryonic lysates were heated at 95 °C in loading buffer for 5 min and electrophoresed with 12% SDS-PAGE. Western blots were probed with monoclonal anti-Flag (1:1000; Applied Biological Materials, Richmond, Canada) and goat anti-mouse horseradish peroxidase-conjugated antibodies (1:10,000; Santa Cruz Biotechnology, Dallas, TX). The immunoreactive proteins were detected with an enhanced chemiluminescence (ECL) kit (HyClone, Logan, UT). Two-cell and eight-cell stage embryos were unilaterally injected with kdm5c MO and fixed at appropriate stages in MEMFA (4% paraformaldehyde, 0.1 M MOPS pH 7.4, 1 mM MgSO4, and 2 mM EGTA) overnight at 4 °C and then dehydrated in 100% methanol prior to storage at − 20 °C. To prepare the antisense digoxigenin-labeled probes, DNA templates were linearized using restriction enzymes. Probes were generated using SP6 or T7 RNA polymerase (Ambion). Probes were detected using alkaline phosphatase-labeled anti-digoxigenin antibodies (1:1000; Roche, Basel, Switzerland) and nitro blue tetrazolium/5-bromo-4-chloro-3-indolyl phosphate . Total RNA was extracted from embryos using Isol-RNA lysis reagent (5 Prime GmbH, Hilden, Germany). cDNA was prepared by reverse transcription using a PrimeScript™ first-strand cDNA synthesis kit (Takara, Kusatsu, Japan) with RNA extracted from Xenopus embryos ranging from stages 0–40 according to standard protocol. PCR was performed using specific primer pairs (Table 1). PCR products were separated on 1% agarose gels, and images were captured using WiseCapture I-1000 (Daihan Scientific, Wonju, South Korea) and were analyzed by Image J software (National Institutes of Health, Bethesda, MD, USA). Xenopus embryos were harvested at stage 45, fixed in Bouin’s solution for 2 h at room temperature, and then washed in 70% ethanol containing 0.1% NH4OH. Embryos were stained using 0.05% alcian blue 8GX (Sigma-Aldrich, St. Louis, MO) in 5% acetic acid for 2 h at room temperature. The embryos were then washed in 5% acetic acid for 2 h and cleared in 100% methanol, after which they were incubated in 2:1 benzyl benzoate:benzyl alcohol. Fixed embryos were washed with 1X phosphate-buffered saline (PBS), embedded in 3% low-melting agarose in 1X PBS, and sectioned at 100-μm thickness using a vibratome (VT 1000S; Leica, Wetzlar, Germany). To perform TUNEL and pH3 staining, Xenopus embryos were fixed in MEMFA (4% paraformaldehyde, 0.1 M MOPS pH 7.4, 1 mM MgSO4, and 2 mM EGTA), washed with PBS, and then bleached in a bleach solution (3% H2O2, 5% formamide, and 5X SSC). For TUNEL assays, bleached embryos were end-labeled using digoxigenin-11-dUTP (Sigma-Aldrich) and TdT (Invitrogen, Carlsbad, CA). Labeled ends were detected with alkaline phosphatase-labeled anti-digoxigenin antibodies (1:1000; Roche) and nitro blue tetrazolium/5-bromo-4-chloro-3-indolyl phosphate. For pH3 staining, bleached embryos were blocked in a blocking solution (1% bovine serum albumin and 5% goat serum in PBS) and probed with anti-histone H3 (1:1000; Abcam, Cambridge, UK) and anti-rabbit IgG AP-linked antibody (1:2000; Santa Cruz Biotechnology). pH3-positive cells were detected by nitro blue tetrazolium/5-bromo-4-chloro-3-indolyl phosphate [39, 60]. Total RNA was extracted from each sample, and an RNA sequencing library was constructed using polyA enrichment according to manufacturer’s instructions (Illumina, San Diego, CA). X. laevis cDNA sequence reads were mapped from the genome project consortium  using BWA (version 0.7.15) to estimate mRNA abundance, and then, differentially expressed (DE) genes were analyzed using edgeR (version 3.20.7). Genes with greater than fourfold change and false discovery rates (FDR) less than 0.01 in exact tests were considered to show significant differential expression. To test overrepresented biological processes in these DE genes, we used Fisher’s test provided by the PANTHER database (released 20171205) with human orthologous genes based on best hits using BLASTp search. Raw data for RNA-seq are available at the NCBI GEO database (accession number GSE117754) . WISH and RT-PCR data were analyzed using ImageJ software (NIH; http://imagej.nih.gov). Results were interpreted by nonparametric, one-tailed Mann–Whitney rank-sum test using GraphPad Prism 7 software (GraphPad Software Inc., La Jolla, CA). P values < 0.05 were considered statistically significant. Y-EJ, KK, TI, H–KL, and CK performed the experiments; Y-EJ, KK, TI, H–KL, TK, and H–SL performed the data analysis and wrote the manuscript; J-WP, O-SK, B-SK, D-SL, T-JP, TK, and H–SL designed the experiments, interpreted the results, and critically analyzed the manuscript. All authors read and approved the final manuscript. No competing interests to be declared. The experiments were strictly conducted according to the documented standards of the Animal Care and Use Committee consistent with international laws and policies (National institute of health [NIH] Guide for the Care and Use of Laboratory Animals, NIH Publication No. 85-23, 1985). We received an approval number from the Institutional Review Board of Ulsan National Institute of Science and Technology for the experimental use of amphibians in Korea (UNISTACUC-16-14). All members of the research group were trained for the appropriate care and use of experimental animals. No unexpected deaths of adult Xenopus were reported during this study. This study was funded by the National Research Foundation of Korea (NRF) (Grant No. NRF-2015R1A2A1A10053265) and the Ministry of Science, ICT, and Future Planning (MSIP) (Grant No. 2015R1A4A1042271), the Republic of Korea. 13072_2018_241_MOESM1_ESM.pptx Additional file 1: Fig. S1. Western blot analysis supports the specificity of the kdm5c MO. The embryos were microinjected with kdm5c wild-type (WT) RNA with or without kdm5c MO. To analyze the specificity of the kdm5c MO, we microinjected the embryos with kdm5c* RNA with or without kdm5c MO. Western blot analysis revealed that no protein expression was detected for embryos injected with kdm5c MO/kdm5c WT. On the other hand, strong protein expression of Flag-tagged kdm5c was observed in embryos injected with kdm5c* alone or together with kdm5c MO. WB, western blot. 13072_2018_241_MOESM2_ESM.pptx Additional file 2: Fig. S2. Transcriptome analysis revealed that KDM5C is essential for Xenopus embryonic development. We performed RNA-seq and analyzed groups of genes that are essential for several biological processes. The downregulation of specific genes by kdm5c knockdown indicated that KDM5C plays significant roles in organ development and structure morphogenesis.